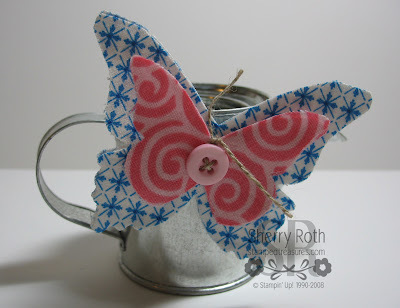 This beautiful butterfly magnet is another sample that I made for my Fun with Fabrics class. I used our Beautiful Butterflies die (114507) to cut out a couple of the different butterflies. I then used our Anywhere glue stick (104045) to stick two of the same sized butterflies back to back. This just makes them a bit sturdier. I then just stitched some linen thread through a button, leaving the ends a little long so it looks like antennae. To make it a magnet, I used my hot glue gun to add a magnet to the back. Wouldn't these be fabulous as barrettes for a little girl? Super cute!